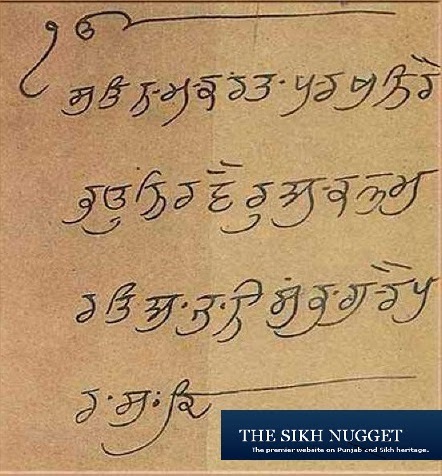 Mool Mantra on a Manuscript scribed by Guru Hargobind, Central Sikh Museusm. The Shiromani Gurdwara Parbandhak Committee (SGPC) has decided that all rare manuscripts and scriptures and other related texts on Sikh religion and history will be preserved by using the latest technologies including digitalization. This decision was taken at a meeting of an SGPC sub-committee which was formed last year to suggests ways and means of preserving rare Sikh scriptures, including the 'birs' of the hand- written Guru Granth Sahib, manuscripts and other related rare books on Sikh religion and history lying at the Sikh Reference Library in the Golden Temple complex. The meeting was held at the SGPC headquarters here on Wednesday. In a release issued later, SGPC general secretary Sukhdev Singh Bhaur, who chaired the meeting, said, "A number of decisions were taken including digitalization of records. All these decisions will be put up for approval in the next meeting of the SGPC executive". Bhaur said that in addition to computerization of all records at the Sikh Reference Library, the sub-committee also decided to set up two other similar libraries. These would be located at Talwandi Sabo in Bathinda district and at the Gurcharan Singh Tohra Institute at Patiala.
" We will recruit qualified persons for all these libraries, that is those who are well versed with the latest techniques in preserving rare manuscripts", he added. Bhaur indicated that the SGPC had sometime back tied-up with the Mohali based Nanakshahi Trust for carrying out preservation work at the Sikh Reference Library. Some noteworthy suggests were made by this Trust which were implemented, with positive results, he added. Besides Bhaur others who took part in the meeting included SGPC member Rajinder Singh Mehta, former member Amarinder Singh, SGPC secretaries, Roop Singh and Satbir Singh, Guru Nanak Dev University (GNDU) professor, Dr Balwant Singh and Dr Devinder Singh, Director, Nanakshahi Trust. The staff of the Sikh Reference Library was also present.